Premise- Four teams comprised of two contestants each compete in a series of four mental, trivia challenges while trying to escape four booby-trapped rooms. The team who performs the least well in each round will be eliminated from the game and leave with nothing. The remaining team will face the fourth and final room for the grand prize. If the surviving team can complete the last challenge, they will win $10,000. Otherwise, the team will leave with nothing. In the past 25 years, there have been multiple game shows that have attempted to create a format in which contestants had to perform physical and mental challenges while being distracted by various methods of torture to strike fear into their hearts and to give them a sense of urgency and danger. Some were successful such as Fear Factorand Total Blackout, while some were disastrous such as The Chamber. Exithas the potential to become one of those successful, aforementioned type of game show. The new SyFy series have challenging mental puzzles and trivia games to accompany the great gameplay and the excellent play-along factor, booby-trapped rooms that look realistic and not cheesy as seen on Secret of the Cryptkeeper’s Haunted Houseand It’s Torture and not as extreme and life threatening as The Chamber. 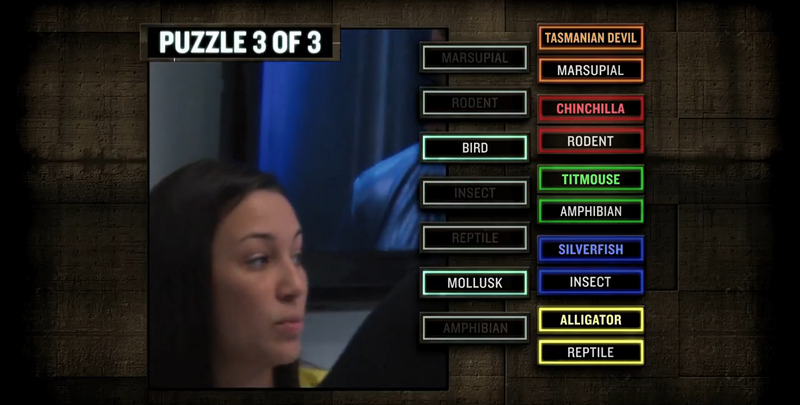 What I enjoyed most about the variety of trivia puzzles on Exit are that they are suspenseful and heart-racing, they provide the contestants with a sense of danger, and they are, without a doubt, a strain on the membrane. As the host, Curt Doussett has the idealistic demeanor for the show: he is brief, serious, stern, doesn’t waste time with small talk and places needed emphasis on the gameplay and the teams’ performance in each round. The only changes I would make to the show would be hiding the host’s identity and make a few alterations to some of the games. Firstly, because the show closely resembles the Saw movie franchise, there should be more mysterious and enigmatic elements added to the series such as the host concealing his identity in an undisclosed location, never to be seen in person, like Jigsaw or the host of GSN’s Inquizition. Secondly, some of the games could use some tweaking such as the “Freeze Blaster” in the second round. The challenge could have been more effective if the viewers could have seen the temperature of each team’s room and if the rooms were continually progressively freezing throughout the game. Overall, SyFy made the right choice in picking up this show to pair with Total Blackout. Exit a good, thriller game show with a decent grand prize and filled with variety where the contestants are not only competing against each other, but also against an outside opponent; in this case, the diabolical rooms. To be completely honest, even though I love the show’s concept, I can see this show having a brief run for about two seasons, considering the series premiere ranked 25th in its 10:00pm timeslot and drew in an average 662,000 viewers. Watch new episodes of Exit Tuesdays at 10:00pm EST on SyFy!